“College ready: Graduating student is prepared for any postsecondary education or training experience, including study at two- and four-year institutions leading to a postsecondary credential (i.e., a certificate, license, associate or bachelor’s degree); has the English and mathematics knowledge and skills necessary to qualify for and succeed in entry-level, credit-bearing college courses without the need for remedial coursework. Arizona allows students to earn dual credit in academic and/or CTE courses through dual enrollment and concurrent enrollment—the former in a high school setting or joint technical education district campus, the latter on campus at a postsecondary institution. Public postsecondary institutions are required to accept these credits (Education Commission of the States, 2015). The Center for Native Education and the National Council of La Raza have partnered with institutions of higher education to each provide one early college high school program as part of the Early College High School Initiative (ECHSI). More information about schools participating in ECHSI is available at the ECHSI website (Jobs for the Future, n.d.). 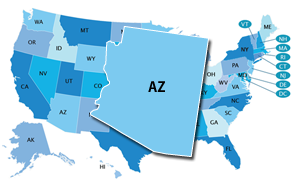 Arizona maintains 71 programs of study aligned with each of the 16 Career Clusters. In 2008, Arizona mandated that all students in Grades 9–12 have an Education and Career Action Plan (ECAP) (U.S. Department of Labor, 2013). Students, parents, and school personnel (i.e., counselors, teachers, administration, or career center staff) can work together to create an ECAP, or Education and Career Action Plan, which is designed to help students reflect on coursework, career aspirations, and extended learning opportunities. ECAPs are updated annually throughout high school and in into the postsecondary years (Arizona Department of Education, 2012). Arizona’s state-specific Early Warning System is called the AZDash. The level at which Early Warning System data are reported and who can access the data is not publicly available.